While your average modern car is not yet an electric hybrid automobile it’s electrical systems are none the less very advanced. Your cars headlights and brake lights to ignition system, starting system, temperature control system and entertainment systems not to mention navigation systems are all electrical and electronic devices. A good battery is essential to keep all of these components functioning properly and even the best battery will need a good charge from your cars built in alternator whenever it’s running. An alternator converts a small portion of the mechanical energy generated by your car’s engine into electrical energy used to continuously charge the battery whenever the engine is running. 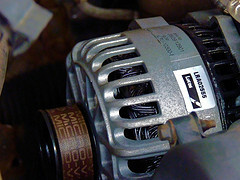 The primary components of any cars electrical system are 1) battery, 2) alternator & 3) regulator. Automotive batteries are normally lead-acid batteries. Lead plates in the battery react with the acid to release electrons used to start and operate a car. Automotive starters require a lot of energy all at one time, car batteries are designed to deliver the cold cranking amps needed to get your car running. After a car is started the various electrical systems need a lesser amount of energy to operate. All of this electrical activity serves to dissipate the batteries charge. An alternator and voltage regulator serve to restore the batteries charge to full so it’s ready when you next need it. If your car is hard to start, cranks slowly while trying to start or doesn’t crank at all our trained automotive technicians are ready to address the issues at hand. We’ll fully test your cars charging system including its main components. We’ll test your car’s starter to be certain it is in top working condition and report any issues of concern back to you prior to making any repairs. Call Bowe’s Exxon Car Care Center today to schedule an appointment to test your cars alternator, voltage regulator, battery, starter and complete electrical system!